I’m Dr. Charles Eaton, executive director of the Dupuytren Research Group. I want to tell you about groundbreaking research the Dupuytren Research Groupis doing to find a cure for Dupuytren disease. What is Dupuytren disease? Dupuytren disease is the most common crippling hand condition that people have never heard of. It affects at least ten million Americans, making their fingers permanently bent, sometimes severely. Why isn’t it more commonly known? Dupuytren contracture makes the fingers bent as if relaxed, not obvious unless the person tries to open their hand. It progresses slowly, usually doesn’t hurt, and mostly affects seniors. It’s often mistaken for arthritis or tendinitis. Why is it important? Bent fingers are only part of the picture. Dupuytren disease is a systemic problem. It can affect the hands (Dupuytren contracture, Garrod knuckle pads) and the feet (Ledderhose Disease). Developing one of these increases risk of developing others. It is a serious health issue. People with Dupuytren contracture have a greater risk for cardiovascular disease, several types of cancer, and early death – for reasons unknown. There is no prevention and no cure. Why? The only available treatments are by surgeons, and most research has been on procedures, not the core biology. Current treatments are inadequate. Surgeons treat contractures, but improvement is often partial and temporary. Over time, repeat procedures become less effective and more dangerous. Long term problems with progression and re-contracture have not improved in the last fifty years. Understanding Dupuytren biology may lead to better treatment for other serious medical conditions. Dupuytren biology overlaps that of other fibrotic conditions, including cardiovascular disease, cirrhosis of the liver, pulmonary fibrosis, scleroderma, and others. It’s no coincidence that most of these conditions also lack effective medicines – they share parallel biologic pathways. Who is affected? Anyone can develop Dupuytren disease. Some groups have a higher risk. Dupuytren disease often runs in families. It’s genetic, but can skip several generations. It’s most common in Caucasians. In most, it appears in senior years – in previously normal hands. An estimated ten million Americans (thirty million worldwide) have signs of Dupuytren disease. Dupuytren celebrities include politicians Ronald Reagan, Margaret Thatcher, Mitt Romney, actor Paul Newman, singer Frank Sinatra, comedians Bill Murray, Chelsea Handler, and many, many others – in all walks of life. What is the Dupuytren Research Group? We are an independent 501(c)(3) public charity established in 2008. Our mission is to find a cure for Dupuytren Disease as rapidly and efficiently as possible. All our board members are intensely focused on this goal because we are either hand surgeons who have seen too many problems with Dupuytren Disease, have Dupuytren Disease ourselves, or both. Our membership represents all 50 states and spans 70 countries. We provide free patient support, host academic conferences, and author academic publications. Our flagship effort is the International Dupuytren Data Bank (IDDB). The IDDB has been developed by the Dupuytren Research Group in collaboration with an international research team from renowned academic institutions. We are the only organization on the planet focused entirely on a Dupuytren cure. Recruit, enroll, and survey patients across the globe through secure online forms to collect information about their disease, its progress, and other medical factors. On reaching enrollment and funding goals, blood tests of enrollees will be collected to analyze DNA and other serum biomarkers. On reaching target numbers for phase 1 and 2, survey and laboratory data will be correlated to identify molecular targets for drug development. What makes the IDDB unique? Why is it a better strategy better than other Dupuytren research? It avoids past mistakes. Dupuytren Disease has baffled surgeons for almost two centuries. This is no surprise. The focus has been the wrong target – the bent finger – missing the real culprit – the underlying biology. We expect better results because we are looking at the cause, not the effect. We’re studying biomarkers in addition to DNA. DNA is an obvious suspect because Dupuytren disease runs in families. However, DNA shows lifetime risk, not disease activity. In contrast, non-DNA biomarkers can show changes in disease activity and day-by-day response to medicines. DNA requires a large sample size for meaningful research: 10,000 Dupuytren patients and 1000 non-Dupuytren control patients. Non-DNA biomarkers might be found with far fewer samples than needed for DNA analysis – saving time and cost on the road to finding a cure. Promising Dupuytren biomarkers include fibrocyte levels, microRNA, and collagen-related enzymes. It’s the fastest way to diagnose early Dupuytren disease and to evaluate Dupuytren treatments. Currently, the diagnosis of early disease is an educated guess based on look and feel. 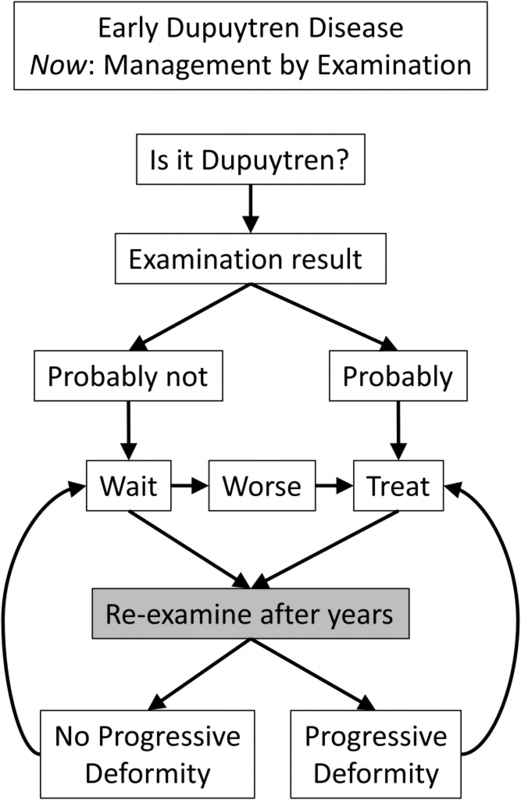 Because there’s no lab test for Dupuytren disease, it may take decades to know whether or not that guess was correct. Similarly, the only way to test whether or not a treatment works is to measure the angles of bent finger joints, which can take years to change. Dupuytren biomarkers are a dramatic upgrade to this traditional approach. 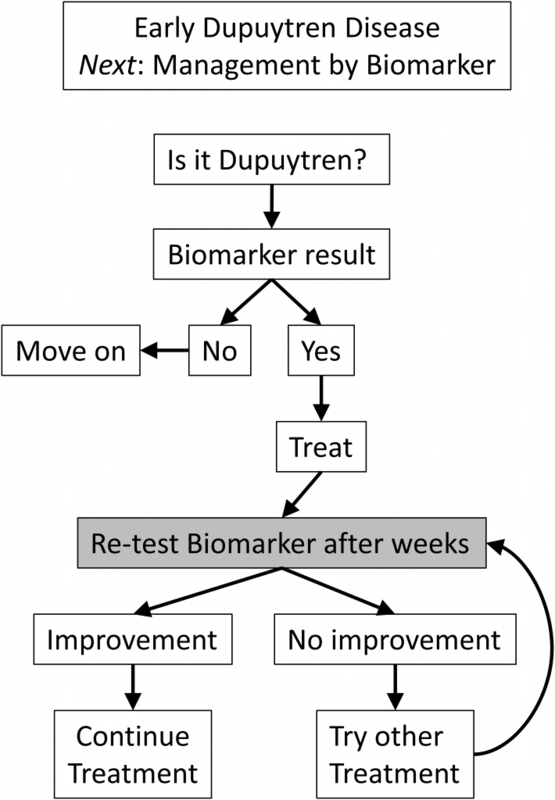 If a treatment improves a biomarker test, it should also affect the progress of Dupuytren disease. Results can be measured in weeks or months, not years or decades. It’s cost-effective. Our approach, using crowdsourcing and direct-to-patient enrollment, bypasses the need for physician participation or practice overhead. This lowers both cost and complexity compared to traditional multicenter studies. This study has a five-year timeline to advance medicine and improve the lives of millions. It will require fewer people than would fill a sports stadium and will cost less than a 30-second SuperBowl ad. We have a scalable, incremental, logical approach. Biomarker research, complex and expensive, must be streamlined on an ongoing basis for efficiency and cost control. Our starting point is a 100 patient pilot study of surveys and blood tests. Lessons learned from this will refine our biomarker list and improve data collection. Our next increment is a streamlined analysis of 500 patients, which may be enough to find biomarkers. If a useful biomarker isn’t found, we will continue to expand in stages. If needed, we will collect stories and blood tests on the 10,000 Dupuytren patients and 1000 control participants needed for full DNA analysis. The only reason there isn’t yet a cure for Dupuytren Disease is that no one has previously put together all of the pieces to do this type of approach to research. That’s what we are doing, and the more support we have to do this, the faster we’ll be able to reach the goal of a cure. We will find a cure, and you can help make this happen.